Final Update: Daniel rises out of “sure” territory. FFS, who is voting for this person? Update 2: Joey falls to second most likely. Yikes. Update: Joey’s popularity has cratered at Votefair. Current forecast will converge to this week’s current numbers soon, but her fans are abandoning her over there. She falls to third likeliest. Green = projected safe, Red = projected bottom 3, yellow = too close to call. Probabilities assume a bottom 3. See the methodology post for info on how this works. That post contains all the data and the code. The last time Daniel Seavey was projected in the bottom 3 (outside the margin of error) was in the Top 12, and he was almost in a dead heat with Sarina-Joi. The model was only barely comfortable projecting him in the bottom 3, and I’m almost sure that he was, although the producers did not release that information. To say that Daniel is likely to go is a bit of an understatement. His raw safe percentage (before normalization is applied) is 31 percentage points below the cutoff at present. Now, the popularity numbers, as I’ve done in previous weeks, are frozen in their numbers from last week (so that Votefair has time to re-poll people), and thus that might change. Daniel would have to jump from his present percentage of the plurality vote, 2%, to 7%, which would be more popular than Tyanna presently is. I do not see that happening. Now, of course, that’s not to say that Daniel is definitely going home. But he sang in the first slot, his WNTS scores have been abysmal, and his popularity is now the lowest. With fewer women to serve as cannon fodder, Daniel is not going to have an easy time of it. Worsters better get to it if they want to save him. I can’t say that I’m too mad at the model’s performance so far. This week had a bottom 3 of Rayvon, Maddie, and Adanna, which were 3 of the 4 lowest rated in the model’s view. (Daniel was the 4th, of course.) 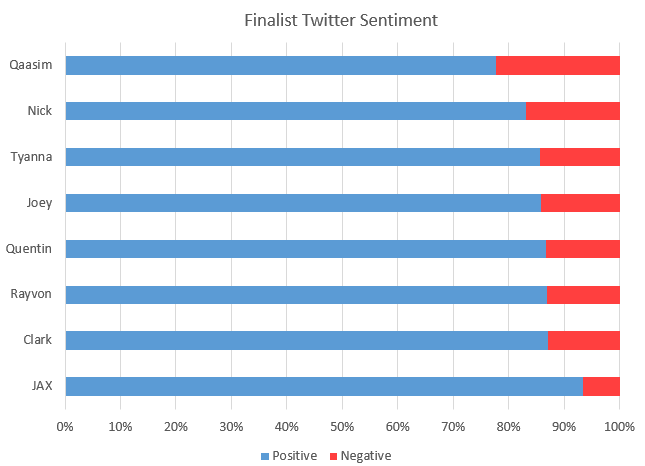 No single indicator would have predicted Adanna’s elimination, which is why I bothered with the model in the first place. She had the 4th highest WNTS rating and was tied with Rayvon and Qaasim in popularity. But she sang first, she’s female, and she was a wild card pick. Bing bang boom. For several weeks there have been a number of people in super-safe territory (> 98%), which is on account of there having been 11 or more contestants and only 3 bottom-3 slots. Now with 9 people, the odds of being that safe are considerably reduced. Clark stays well into that territory, but nobody else does. Joey has fallen significantly, in 6th place and not called safe within the margin of error. At 4th most likely, her fans would be justified being a bit nervous. 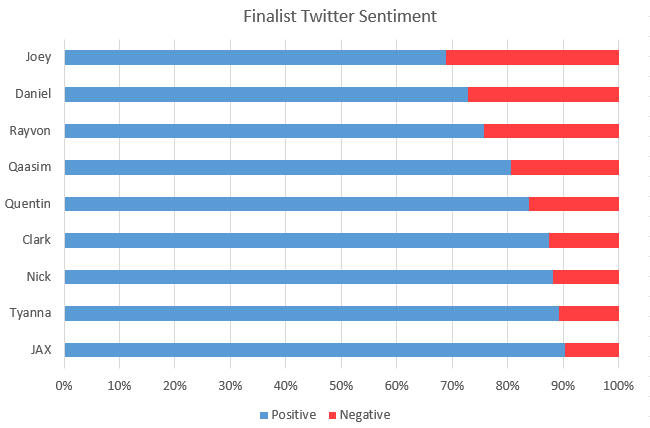 To wit, see Twitter’s response to the Top 9: Joey leaps into last place on positive sentiment, as Daniel somehow recovers to above 70%. I have no historical basis to say what that means as far as her chance of being safe, but I present it anyway for your consideration.